To me personally, Born Free is a timeless classic. This British film left a lasting mark on me as a child after seeing it. I am a huge animal lover and so that is one huge plus about this film. This to me is a wonderful drama that is a powerful film about a real life ordeal. A drama that leaves you with an emotional side. The movie is based on the real life couple Joy and George Adamson. The Adamson’s raised an orphaned lion cub that they named Elsa the Lioness. They raised this sweet wonderful creature until her adult side and then released her back into the wild of Kenya. The movie is based on the book written by Joy Adamson. I think what makes this movie and story stand out the most is the reality of the truth behind the film. George Adamson had to sadly kill a female lion in self defense because the lion was trying to protect her cubs not realizing George meant no harm. There he finds the three cubs she was protecting. He brings all three home with him. Two of the lion cubs are bigger and so they are sent to the Rotterdam Zoo to be protected and raised. The smallest of the litter, given the name Elsa the Lioness will stay in care and protection by the Adamson’s. There the Adamson's care for the lioness and help her to be reintroduced back in the wild after she is grown. The movie is a wonderful and sweet homage to the beauty and wonderment of wildlife. Animals are so precious and like humans, are living beings that deserve to be treated with respect and care. Starring Virginia McKenna and Bill Travers as your main leads. The beautiful stunning McKenna is a dynamic actress that owned every character she ever did. What’s makes Virginia so special is she not only was an actress, but in real life she cared for and educated and campaigned for wild life. Also what is so great about this film is Virginia and Travers where a real life married couple, and so you can see that emotional reality in the film as being authentic. Now I love Virginia from one of her most extraordinary performances in one of my favorite award worthy pieces of cinema, the World War 2 drama 1958’s Carve Her Name in Pride. She created the character of Violette Szabo in a flawless degree that shines still to this day. If you have not seen Carve Her Name with Pride I urge you to do so and experience her dynamic brilliance as an actress. Her beauty was onscreen and off screen. Like her character in Born Free, she in real life cares for animals. It was the movie Born Free that created a spark in both Virginia and George. After the death of an elephant named Pole Pole in a London Zoo, Virginia and her husband George started an organization called Zoo Check Campaign in 1984, but would lead to the name change in the 90’s to Born Free Foundation. This Foundation is an animal welfare check making sure animals are not abused, and also trying to keep them in their natural habitat. There are three things I believe are pure evil, and deserve the harshest punishments, those who commit animal abuse, elder abuse, and child abuse. There is no excuse in any one of those forms of violence. Animal abuse is disgusting and a person that commits that reality has no rights in my viewpoint. Bill Travers was a wonderful actor. An English gentleman with great pride. Travers was not only an actor, but a screenwriter and director. Travers was a golden actor of perfection bringing memorable characters to life in vivid detail. I will always remember him in 1961’s creature feature Gorgo. Acting from 1949 all the way until 1992. He was and is everything great about the world of cinema. He like his wife cared for and campaigned for animal rights. He passed away in 1994, sadly but his legacy lives on through amazing releases like this wonderful Twilight Time Special Edition Blu-ray. Twilight Time has done a lovely job in creating a new perfected outlet to this important piece of cinema. Directed by the one and only James Hill. A powerful British director that knew how to create memorable pieces that last. Not only a director but a producer and writer and director of television. Hill had a long and wonderful career in the business of entertainment and had many important films to showcase that long career. He was known for many types of films, mainly his documentaries and children’s programs, but it was Born Free that brought attention to his style around the world. He was an award winning director. He won the Academy Award for Best Documentary in 1960. Nominated for best Short Subject at the 1964 Academy Awards. Won many awards and was nominated for many awards through his career. His film making stood out and is something to return to over and over again. This has never looked any better than on this blu-ray. The crisp sound, colors and vibrant beauty of this film comes to life in a whole new reality. The transfer is gorgeous. The amazing cinematography by Kenneth Talbot shines on this beautiful High Definition Blu-ray. Isolated score track. This was a fantastic listen by itself for the fact of who is behind it, John Barry Pendergast. A master talented composer, conductor and musician of film. He has worked and created some of the greatest film scores such as the brilliant masterpiece Midnight Cowboy, Dances with Wolves, and might I add was the original person to arrange and perform the iconic James Bond theme on the very first James Bond film Dr. No. He through the span of his life won many awards, but also most importantly won 5 Academy Awards for his excellence in film scores. Of those five two of those Oscars where for Born Free and that is what makes this film stand out all the more, is the music behind the beauty of this film. Twilight Time did an amazing job honoring this master on this special feature. Also you get a wonderful commentary by three amazing film historians, Jon Burlingame, Julie Kirgo, and Nick Redman. A fantastic listen. I always cherish listening to those who love film and respect film. 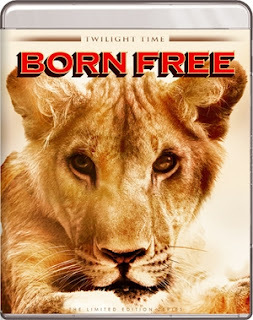 Born Free is an excellent film. It’s a film that should be seen, respected and thankfully Twilight Time has honored this film, respected this film, cared for this film through a wonderful 3,000-unit special edition. This is a must own blu-ray of high quality with an excellent transfer through audio and video. Loved the isolated music score, and the commentary. The film is a wonderful trip back into the early stages of fighting for animal rights. A bio-picture of two important persons. Also the reality of two stars creating an organization for the care of animals and their rights through this film. A beautiful film lovingly resurrected in a high quality HD blu-ray that shines and sticks out as being something to own, share, express and fall in love with all over again. Twilight Time perfection.